On a walk in mid June I passed a garden where this astonishingly large potted pineapple was growing. Its owner said that the full size pineapple had taken 2 months to develop and I was amazed by its health and size. I have grown pineapples in my own garden but the fruit was always much smaller and I assumed that this was because Sydney’s climate was not hot enough. So what could be th reason for such a large fruit? The site was at the top of a hill with a north easterly aspect. The concrete pot in which the pineapple was growing was about 50cm in diameter and it stood on a paved area in full sun with a boundary fence that allowed light and air circulation there were some roses planted along the fence that moderated winds. The secret here it seems is that the plant is getting lots of radiatiing heat from the pot and from the pavers that the pots sits on, as well as long hours in full sun with good circulation of air. Here is a picture of the usual result I have had growing pineapples in Sydney. The plant is healthy and the fruit that matured in late August was small but still very sweet. When the plant is ready to flower and like many others in the bromiliad family, the centre of the plant becomes red and the flowerhead emerges and delightful purple flowers bloom all along its structure. 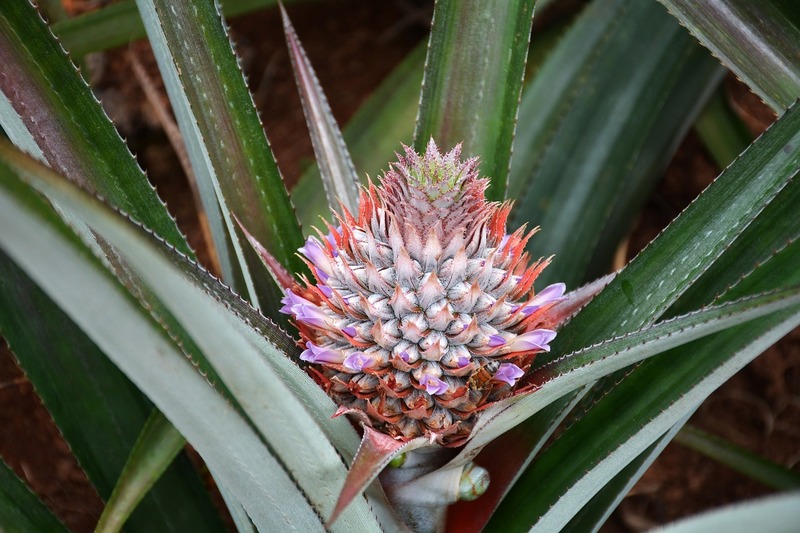 In the pictures below you can see the young developing pineapple with the red inner leaves and one of the small purple flowers ready to bloom with one open. Just click on the image and study and enlarge to see the detail. Here is another with the pineapple further developing. Click to see this this image in close detail. All this has made me determined to try again by replicating the conditions that I have observed and repotting and positioning the others that I have currently growing. 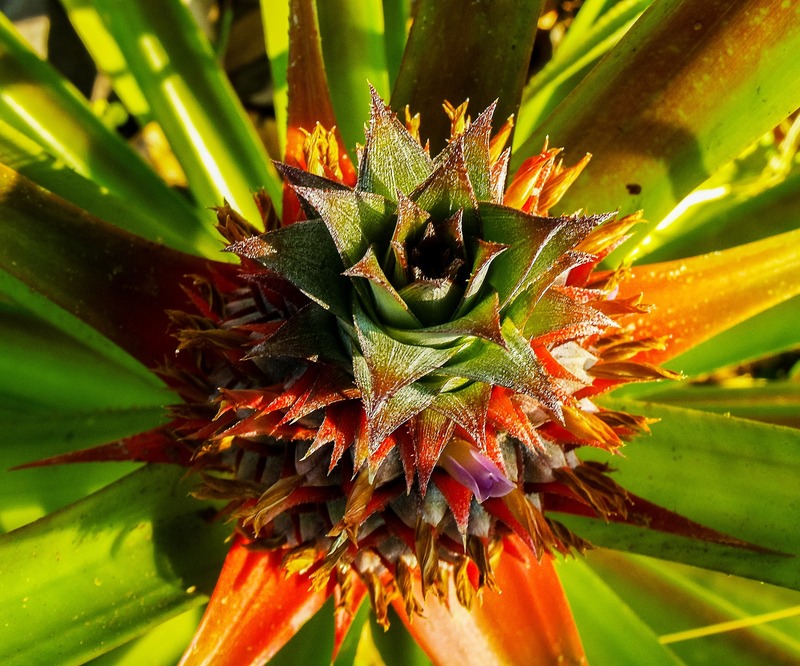 Over the next year I will plant and observe the development of a pineapple plant from scratch so, if you bookmark this page I will be updating it to show you what happens. I will begin using a method that I have found to be successful in the past. If you have children or grandchildren it is a lovely experiment to show how a pineapple grows. We begin with a pineapple purchased from our local markets. I selected a specimen that had a good perfume, had a good shape and size, and had a good growth at the top of the fruit. This is what we will use to start our plant. It will take 24 months or more to develop a new fruit so you will need to be patient. Begin by preparing the pineapple top. Cut the top off about 2.5 cm from the base of the leaves. Grab the leaves with one hand and then tear away the remaining fruit from the bottom of the leaves. This removes the whole top of the pineapple and exposes the area that we wil be preparing. Begin by gently tearing off the leaves sideways. You may expose the emerging roots so do this carefully. Work around the circle to further expose the stem of the plant. 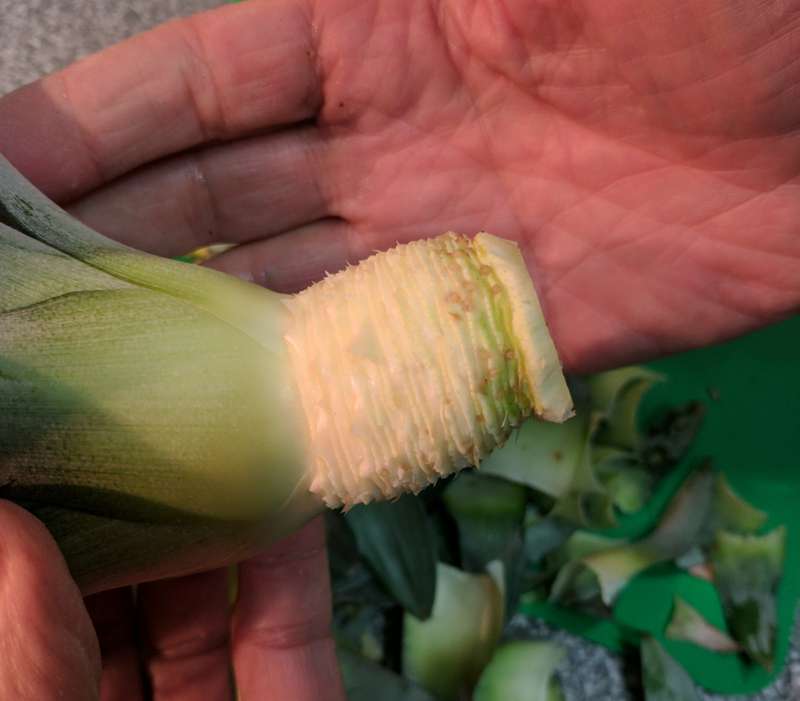 This is about how much of the stem that you need to expose. Now place the pineapple stem into a jar or vase as we have done and cover the exposed stem with water. Replenish the water as it is used by the plant and as the roots develop. Replace the water with clean water weekly. I will mark this post as a sticky just below the main pages and will post images periodically as things happen so check and see from time to time. After the roots have developed I will also continue on and pot the plant and follow its progress. The small white roots can be seen growing from the stem. More roots have sprouted. I have continued to change the water weekly. More branching is obvious from the established roots and the pineapple top is growing well. The pineapple top is growing and the roots are getting longer. The roots are now long and the plant above is doing well. The pineapple top is obviously growing well and in good state. The roots are now filling the bowl and the plant is ready to pot up. Here is the pineapple that we prepared in July. It is doubled in size and has a strong root system. The weather in Sydney is hot and I will pot the plant up today. We have chosen a terracotta pot to grow our pineapple. The weather in Sydney his hot and perfect for the pineapple to grow. We fill the pot with 1/3 stones at the base and then a mixture of 1/3 river sand and 1/3 Cactus and Succulent potting mix. This mixture friable to allow the roots to establish and well draining to stop the pot becoming waterlogged. After filling the pot about 2/3 we made a mound in the centre and gently positioned the plant over the mound fanning out the delicate roots carefully. We gently filled the pot keeping the base of the plant at the level of the soil. We watered it well and covered the surface at the base of the plant with more smooth rocks to stop water evaporation and direct any rainwater down into the pot. we will harden up the potted plant in a shady space for a while then transfer it to a sunny place on concrete that receives as much sun as possible. This pineapple top was harvested and prepared in July, the roots allowed to grow and 6 months later we have planted the top out. In the 6 months the top has grown substantially an we hope it will continue to grow. We will continue to update as the plant grows.